At the end of World War II, Korea was divided into two separate entities: North Korea and South Korea. After this division, a military conflict occurred over territorial disputes in which the United Nations supported South Korea, and The People's Republic of China supported North Korea. The subject of the battle was communism. Over three million lives were lost. However, the war prevented communism from entering the boundaries of South Korea. It marked the beginning of the infamous Cold War and is often referred to as "The Forgotten War" because it occurred just after World War II and just prior to the Vietnam War. Photo at right shows Lt-Col. I.B. Ferguson, D.S.O., C.O. OF 3rd Battalion, The Royal Australian Regiment (3RAR) (centre), during the critical chinese offensives of 1950-51. 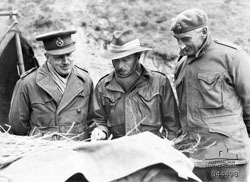 Ferguson is briefing Lt General Sir Horace ('Red Robbie') Robertson (left) and Brigadier Basil Coad (right), Commander of the 27th British Commonwealth Brigade in Korea, c. 1950. The failure to hold free elections throughout the Korean Peninsula in 1948 deepened the division between the two sides; the North established a communist government, while the South established a nominally democratic government. The 38th parallel increasingly became a political border between the two Korean states. Although reunification negotiations continued in the months preceding the war, tension intensified. Cross-border skirmishes and raids at the 38th Parallel persisted. The situation escalated into open warfare when North Korean forces invaded South Korea on 25 June 1950. In 1950, the Soviet Union boycotted the United Nations Security Council, in protest at representation of China by the Kuomintang/Republic of China government, which had taken refuge in Taiwan following defeat in the Chinese Civil War. In the absence of a dissenting voice from the Soviet Union, who could have vetoed it, the United States and other countries passed a Security Council resolution authorizing military intervention in Korea. Within two days, the US had offered air and sea support to South Korea and provided 88% of the 341,000 international soldiers which aided South Korean forces in repelling the invasion. The United Nations Security Council asked all its members to assist in repelling the North Korean attack. Twenty-one nations responded by providing troops, ships, aircraft and medical teams. 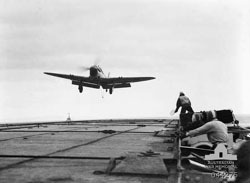 Photo at right shows a Fairey Firefly aircraft of a Fleet Air Arm squadron embarked on the Royal Navy aircraft carrier HMS Glory on final approach for landing during operations in Korean waters as a unit of the United Nations Command, c. 1951. Suffering severe casualties, within two months the defenders were pushed back to a small area in the south of the Korean Peninsula, known as the Pusan perimeter. A rapid United Nations counter-offensive then drove the North Koreans past the 38th Parallel and almost to the Yalu River, when the People's Republic of China entered the war on the side of North Korea. Chinese intervention forced the Southern-allied forces to retreat behind the 38th Parallel. The Soviet Union provided material aid to both the North Korean and Chinese armies. In the three years of fighting 1,263 men of the Commonwealth forces were killed and a further 4,817 were wounded, while the US lost 33,000 men. Australian casualties numbered more than 1,500, of whom 340 were killed. Almost half a million South Koreans died as a result of the war, and an unknown number of North Koreans and Chinese. From 1951 onward, both sides found themselves engaged in a war of attrition reminiscent of the Western Front, where men lived in tunnels, redoubts and sandbagged forts behind barbed wire defences. The war was generally fought with artillery and mines and in set-piece battles; at night patrols ventured into no man's land to raid enemy positions. The fighting ended on 27 July 1953, three years and one month after the war began, when the armistice agreement was signed. The agreement restored the border between the North and South Korea near the 38th Parallel and created the Korean Demilitarized Zone, a 2.5-mile (4.0 km)-wide fortified buffer zone between the two Korean nations. This agreement brought the war to an end, but a state of suspended hostilities continued to exist between North and South Korea for many years, and even today the situation remains unresolved. The ending was so sudden that some soldiers had to be convinced it really was over. After the war ended, the presence of Australians & New Zealanders in South Korea continued with a peacekeeping force until 1957. The terrain in both North and South Korea is so cold and mountainous thatmany soldiers died of frostbite before ever reaching the battlefields. The temperature in some areas fell below zero for periods of time. Many political tensions motivated the conflict between North and South Korea, however the main dispute was over the territory surrounding the 38th Parallel. Before the war, the 38th Parallel marked the official dividing line between the two countries, and, despite all of the fighting and bloodshed, the same line still marks the division between the two countries today. The Korean War is oftenoverlooked as a result of the fact that it came right after World War II. More than three million people died in the war, which crippled many countries' populations after they had already lost so many people in WWII. There are 6.8 million veterans of the Korean War. The Korean War marks the official beginning of the Cold War, as a result of the fact that Russia's dissent with American politics began to surface during this time. Although the Korean War officially ended in 1953, Congress officially marks the end of the war in 1955, as a result of the contentious peace negotiations that followed the ceasefire in 1953. Whereas World War II was marked with many segregated troops in the United States' army, the Korean War marked a time in which both blacks and whites worked together in military operations. MASH units, or Mobile Army Surgical Hospitals, started being used in the Korean War. These units sought to save more soldiers' lives on the battlefield and close to the combat zones. Soldiers in the MASH units had a 97 percent chance of survival, which significantly decreased the large casualty toll on U.S. forces in previous wars. The first major use of jet-powered aircraft occurred during the Korean War.